Saturday found me out in the desert again. 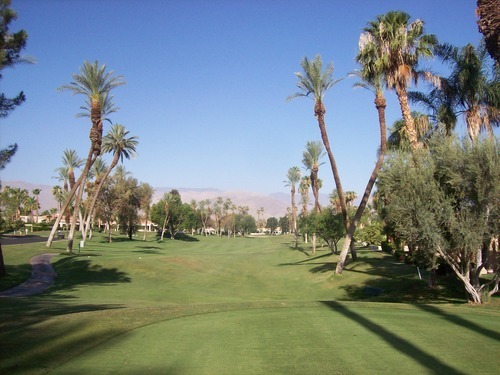 Once the calendar hits June 1, the Coachella Valley golf prices go down and it seems the deals this summer are going to be even more appealing than years past. 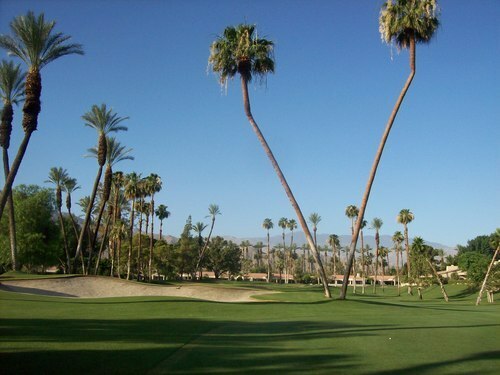 I saw nothing but ridiculously cheap rates as I browsed tee times online, yet I know most courses are still in pretty nice condition this time of year. In other words, it’s a great time to brave the heat and play out there. 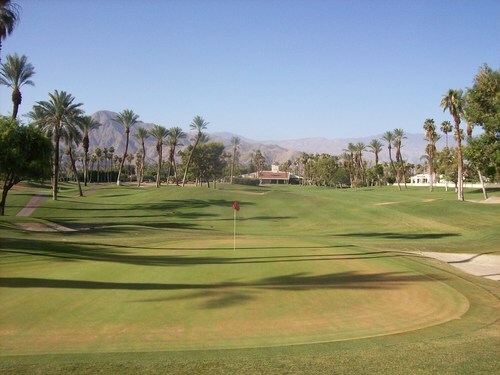 The past couple weeks, I’ve been attempting to reach out to private clubs in the valley to try and get on during the “off season” summer months. Having played all the public regulation tracks out there, I’m hoping that at least a few of the private ones will open their gates to me. So far, the responses has been less than encouraging, with the strong exception of Desert Horizons. They invited me out to play as a guest for the day and I was on my way out there as soon as I could. I booked a 7:00 Saturday morning time as a single and when I showed up, I basically had the place to myself. The friendly staff was setting up some carts for a small shotgun tournament set to go off at 9:00. 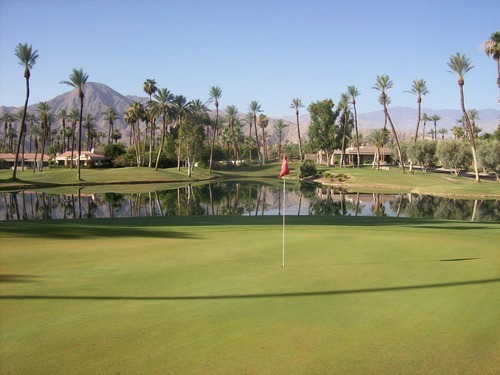 I teed off on my own and it was nice being out there in the quiet and solitude of a picture-perfect early morning in the desert. 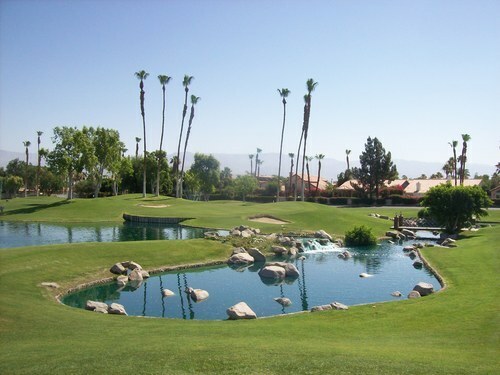 Desert Horizons is one of many classic Ted Robinson designs in the Coachella Valley. In that, it has plenty of similarities to a number of other courses I’ve played, but it’s still a very solid layout on all levels. 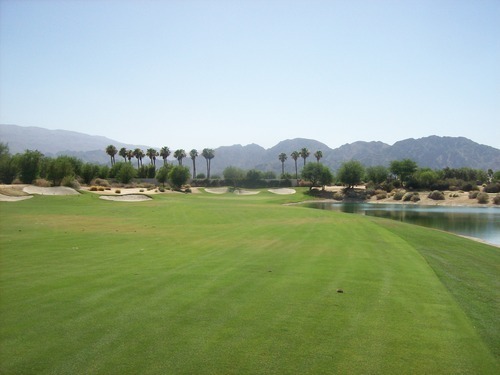 It’s not a course that will beat you up as it’s mostly pretty forgiving from tee to green, but it offers just enough challenge and diversity to keep you on your toes. 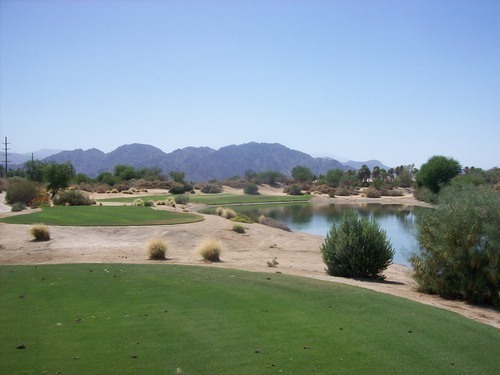 As is expected with a Robinson course, there are numerous water hazards throughout the property that provide some visual intimidation along with aesthetic appeal. 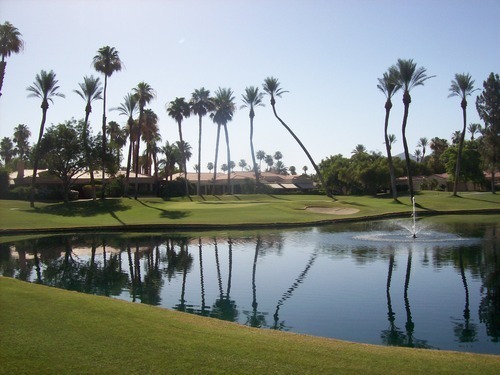 Seeing the tall, skinny palm trees and nearby mountains reflecting in the glassy surfaces is always nice and soothing. Unlike most Robinson courses I’ve played, though, the greens here are a bit smaller and don’t feature as much crazy undulation. That is not a negative statement, but just an observation because usually his greens are pretty intense to say the least. Probably the holes I’ll remember the most are the finishing holes on each side. The 9th is a great par-3 next to the entry road with a direct shot over water. 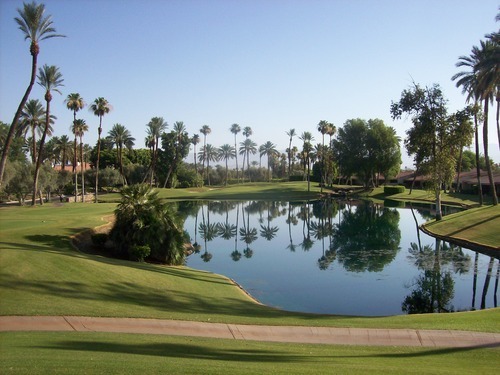 The 18th is a tricky dogleg left where you try to find the ideal position off the tee for an approach over the water. The green is framed by the clubhouse in the background for a nice “finishing hole” presentation. There’s a small balcony overlooking the green, which I believe is connected to the bar/restaurant. I’m sure the members love to sit up there and watch over their counterparts to cheer and heckle as the other groups finish their rounds. 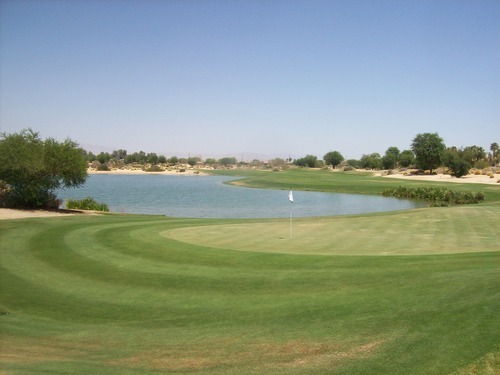 The course was in very good overall condition. They did let me know ahead of time that they are redoing their whole practice area, so it’s a bit ugly next to the clubhouse right now with that renovation going on. The course itself, though, was great. 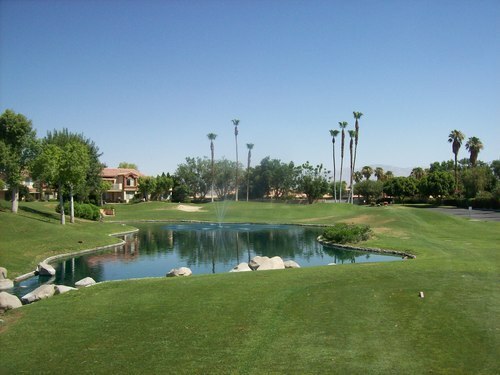 The fairways were lush and I always had great lies. The rough starting to brown out a little bit heading into the heat of summer. It was shaved down tight and not much of a factor. The bunkers were very good and the tee boxes were excellent. The greens were a little thin and burnt-out in places, but mostly pretty good. A tad on the firm side and rolling at medium/slow speeds, as is typical in the summer out in the desert. Overall, it was an enjoyable guest experience at Desert Horizons. 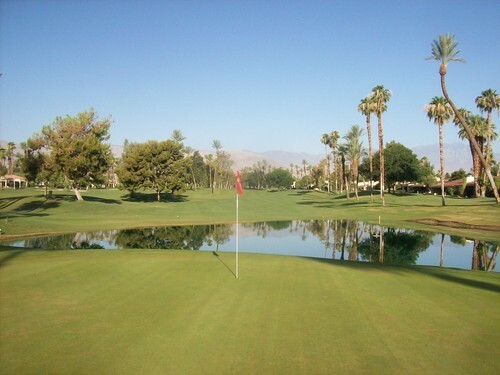 Certainly, if you get a chance to play it, the club is worth a visit. 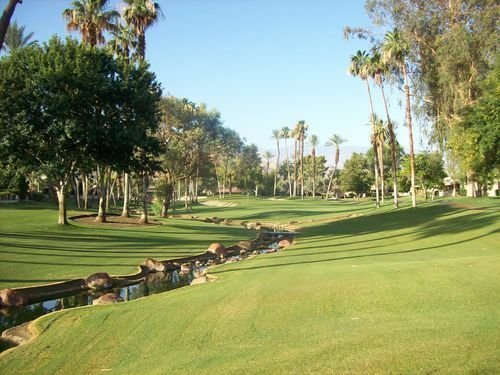 It fits right in amongst the stable of great classic country club courses found throughout the valley, so you can always expect a quality experience. I knew a little about this course heading in. I knew I’d play it eventually to fill some time without spending much money. After some breakfast, I headed over to the course and got there around 10:00. I figured the place wouldn’t be too crowded on such a hot day and I was right. 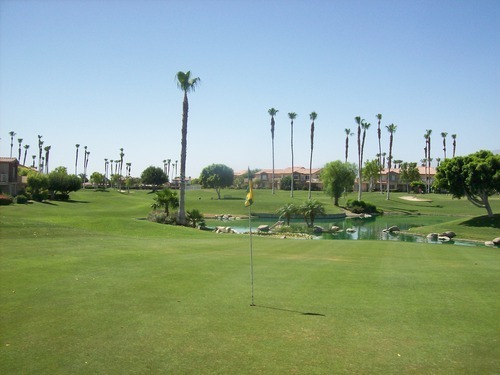 Palm Royale is an 18-hole par-3 course. 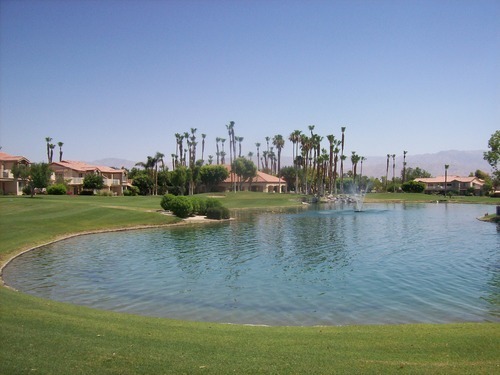 It’s part of a small community that is right across the street from the big Indian Wells Tennis Garden complex. I could see a few people out on the course and there was just one bored-looking guy working inside the tiny pro shop. I saw a sign-up sheet outside with a note about “honor system” payment during the weekdays, so it’s a pretty casual little place that obviously doesn’t get much play this time of year. Why? 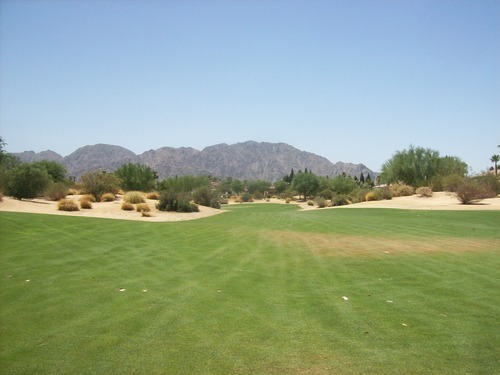 It’s not because the course is lacking in appeal. 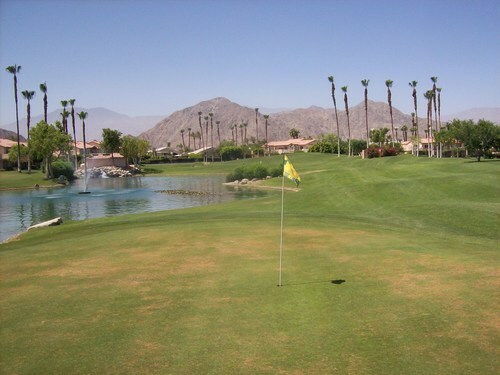 It’s actually a fun “pitch and putt” design with a good mix of holes and fun challenges. The one deterrent is the fact it’s a walking course. In other parts of the year, that’s fine, but in the heat of summer it’s not as appealing for most. 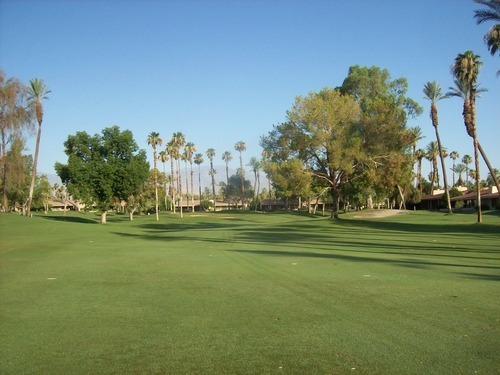 I myself underestimated how brutal it would be to walk the little course and carry my bag amidst the 100-degree temperatures. I definitely worked up a good sweat! 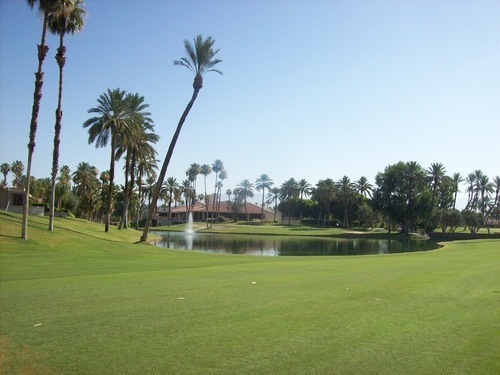 Otherwise, Palm Royale is a great little course and the price was only $10 for 18 holes. They do have pull carts for rent at $3 if you want to lighten your load a bit. It was also designed by Ted Robinson and it’s easy to tell. It has all his signature features, but just in miniature. 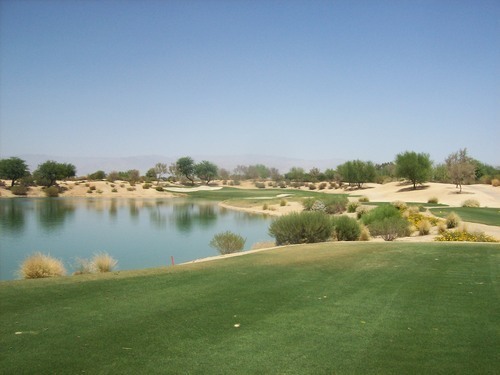 It’s like he was hired to design a course for Mini Me—just like Desert Springs, but a fraction of the size. From the nice water hazards (with a few tiny waterfalls) to the wood-plank-lined walls along some of the edges, it’s a Robinson look all the way. The greens and bunkers also feel like shrunk-down versions of what you might expect, complete with tricky undulation and severe slopes. 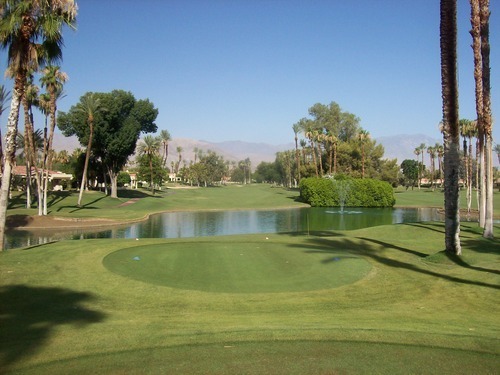 Half of the holes are actually pretty basic, and then there are more “signature” water holes spread throughout the course. 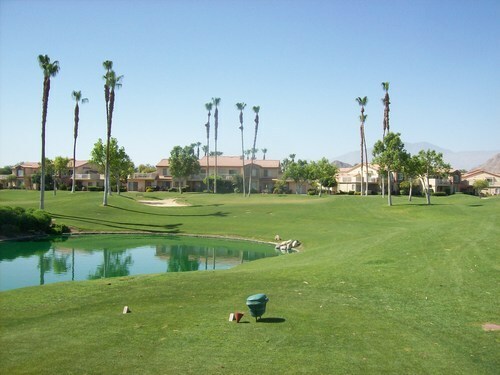 The distances range from the 80-yard range up to a couple holes over 150. 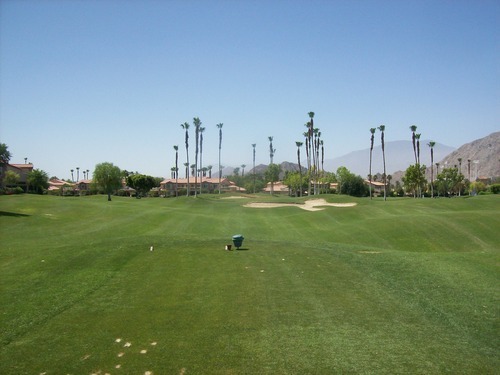 Most are around 100, so it’s a great place to work on your wedge game. 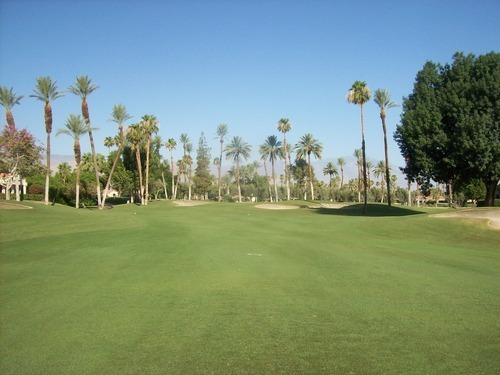 Despite such minimal play this time of year, Palm Royale was in pretty decent condition. 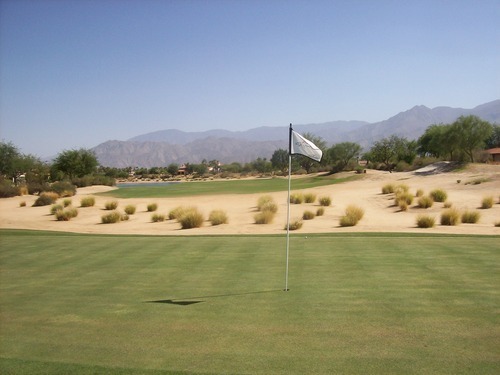 The greens were firm, slow and a little thinned out in places, but fine enough. The tee boxes were good and all the grass in between was pretty well maintained. Far from pristine, but pretty darn good for a course of this caliber. The guy in the pro shop did tell me they usually shut down to the public later in the summer. There’s just not enough business to justify staying open or maintaining the course. 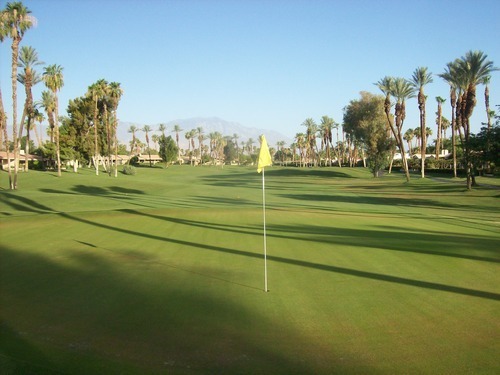 It sounds like they do minimal maintenance and members/residents are still welcome to play if they want. 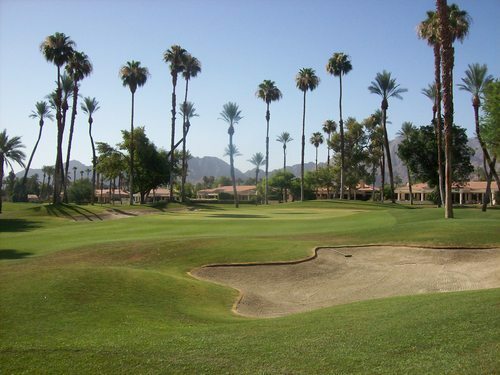 Palm Royale is a great little course for beginners or those just wanting a casual, fun, cheap and quick round while in the desert. Set your expectations properly and you’ll have a good time here. And if you are a Ted Robinson fan, you’ll appreciate the distinctive look of the course as a scaled down representation of his style. 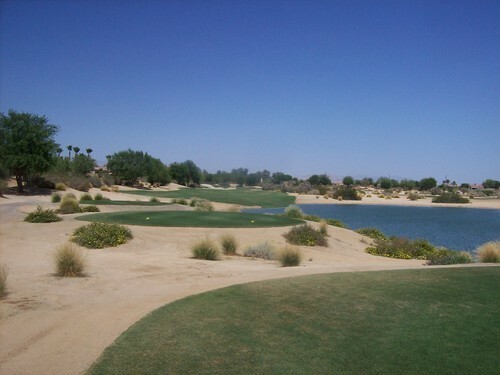 I’ve been looking for an excuse/opportunity to come back and play this course again. The first time I played it was many years ago as part of a work tournament. 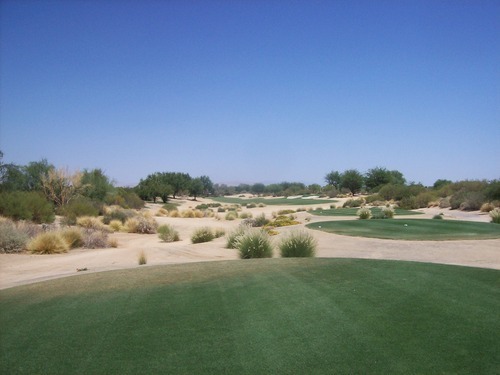 Even though it was one of the first desert courses I had ever played, nothing about the experience seemed to stick with me throughout the years since. Frankly, I remembered very little about it. Well, Saturday offered the opportunity I’d been waiting for as I saw a GolfNow “hot deal” earlier in the week. I waited until Friday to book because the price kept going down. It went down to a very appealing $28, I finally snatched it up. 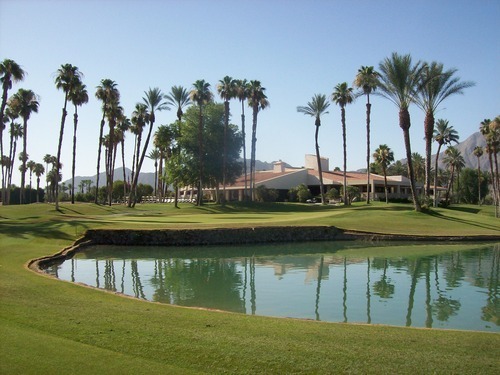 To play any of the PGA West/La Quinta courses for a price like that (no matter what time of year) is a deal that’s hard to pass up! The tee time was for 1:30. I could tell by looking at their online times that they had a shotgun start in the morning at 7:30 and then it appeared 1:30 would be the first afternoon time available. I figured this would work out great to be in the first group out in the afternoon for a quick pace on a hot day. I got there early around noon in the hopes that the morning group would clear out and they might allow me to get out ahead of the actual tee time. The place was very hectic as the morning group was finishing and they were trying to turn carts around for afternoon play. Unfortunately, I learned that there was another smaller shotgun group set to go out at 1:00 and then I’d be in one of the groups following directly behind. Ugh! I did some begging, whining and pleading to try and work something out. I really wasn’t in the mood for a 4.5-hour-plus round in that heat (especially after already playing 36 in the morning). I noticed they had the shotgun set up so there were two groups on each hole from 1-7. 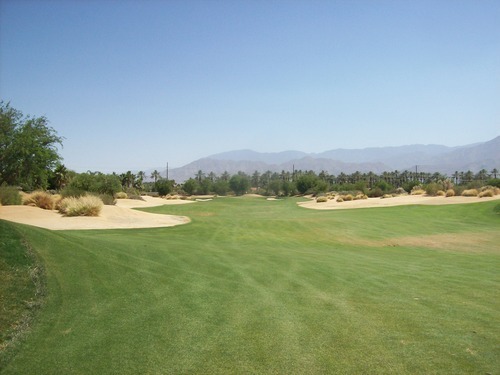 It seemed like a recipe for slow play and also meant the back nine would be empty for awhile. I had to really work everyone I could talk to, but they finally relented and let me go off the back by myself at 1:00. 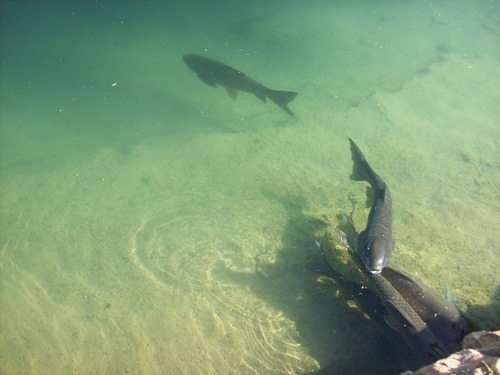 Sometimes it pays to be a pest. 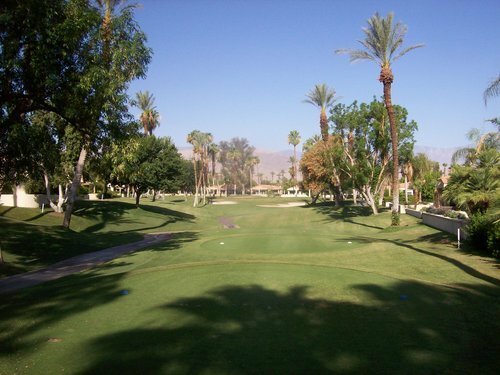 I flew through the back nine and when I got around to the front, the 1st tee was open. There was a twosome on the fairway ahead. I eventually joined them a few holes in and played the rest of the front nine with them. Things were stacked ahead, so there was nowhere to go. Still, the pace wasn’t horrible and the total round only took three hours. 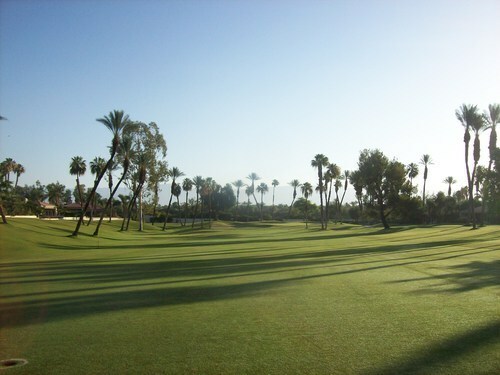 Getting to play the back nine on my own was huge and definitely saved me at least an hour’s worth of time out there in the sun. Anyway, as for the course itself, Norman is better than I remember. True to his Aussie roots, the layout has a more rugged desert feel with somewhat linksy design. The landscape is flat, so the contours are subtle. He used the natural desert sand and bushes to provide the outer frames of each hole. 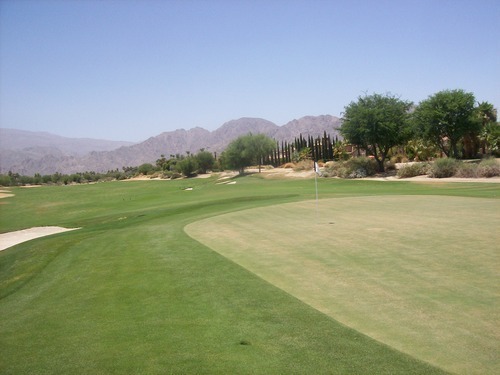 There are big sprawling carpets of fairway with barren desert on the sides with no rough in between. 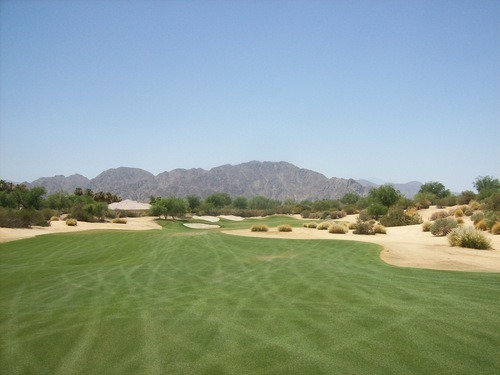 The only patches of “rough” are some collars of slightly thicker grass around most bunkers. 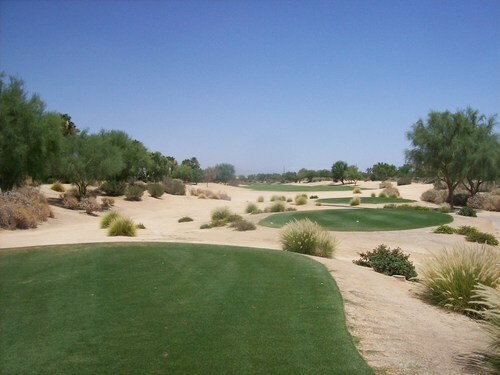 Otherwise, it’s fairway or the desert, so it’s kind of an interesting look. 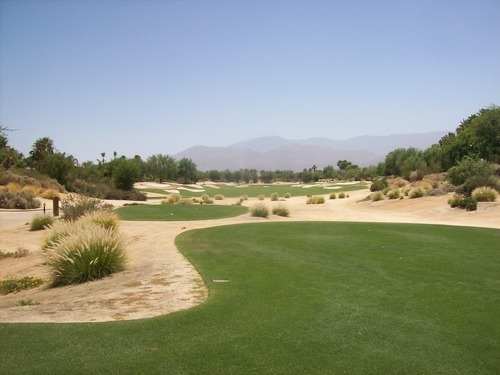 The fairways are very forgiving, so it takes a really stray shot to get into major trouble. There are plenty of bunkers also in play, but for the most part getting off the tee safely is not the challenge here. 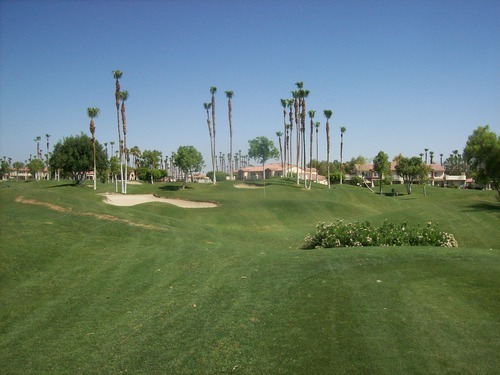 There are several long holes, which will make you work from tee to green. 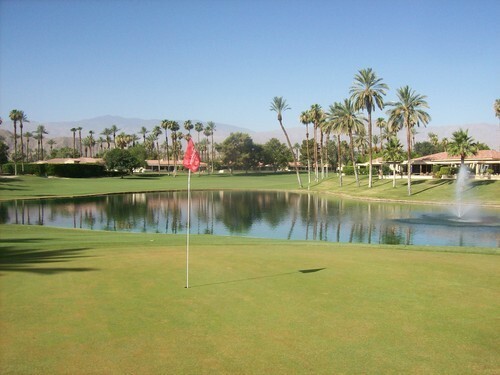 However, most of the challenge is found on and around the greens themselves. 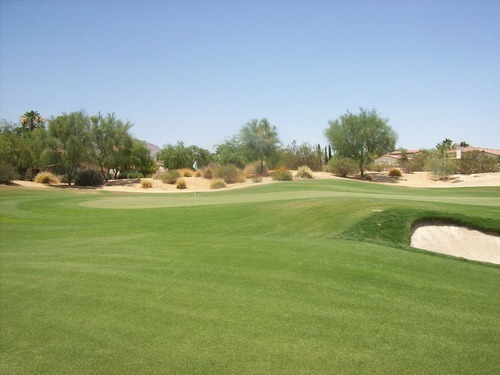 The greens on the Norman course are very unusual shapes and varying sizes. Most have some very narrow portions and then run-off areas on all sides. They had the pins set up in some of the very toughest spots thanks to the tournament groups that were out that day. 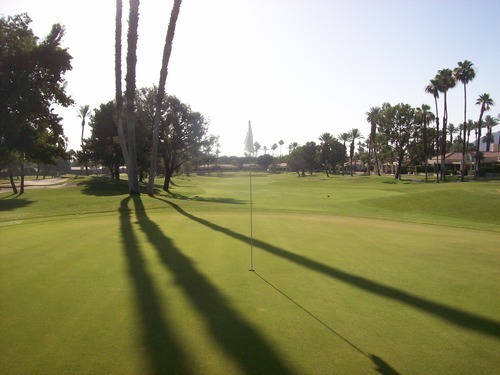 The greens are very difficult to hold to begin with and there aren’t many good places to be if you miss them. All day long, I was faced with very awkward chips or long putts from off the greens that made it extremely tough to get up and down. No matter where you miss, it seems like you’re in a bad spot. 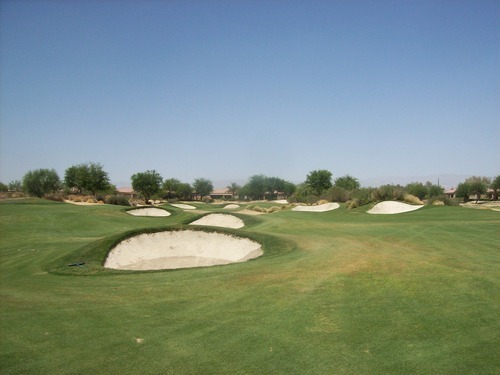 And if you do happen to find one of the relatively deep greenside bunkers, good luck! 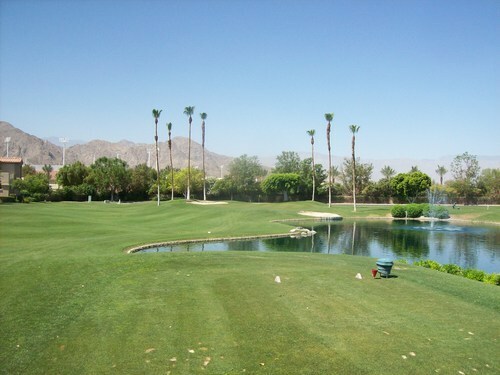 Plenty of water comes into play on the course, as well. There are some really big water hazards to make for some tough approach angles and very tight lay-up areas on a couple of the par-5s. 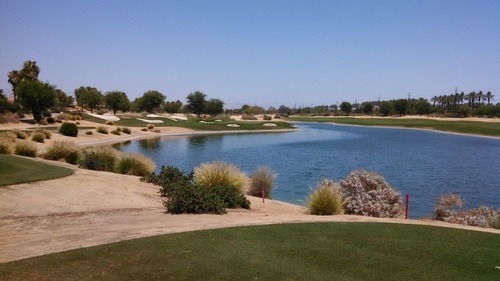 A great par-3 is the 13th, which is a long and tough one right over the water. There’s not a lot of room for error with water along the right and some big nasty bunkers on both sides of the long, narrow green. 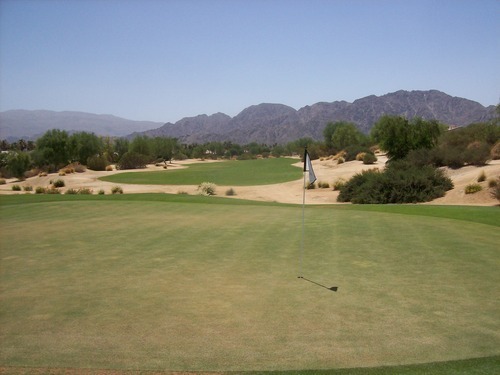 The course was in very good condition heading into summer. The tee boxes were just about perfect and the fairways were excellent. They were mostly green with only a few light patches here and there. I always had perfect lies. The bunkers I found were great. 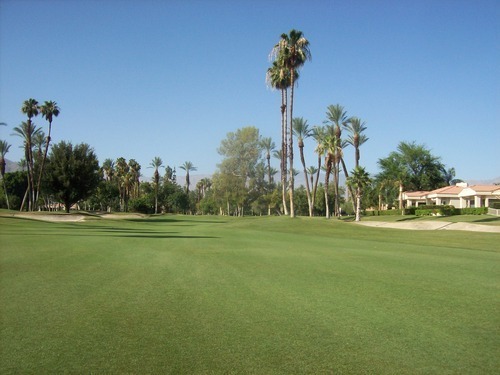 The greens were pretty dry, brownish, extra firm and a little bumpy. Definitely in summer shape and rolling at medium speeds. The breaks here are subtle and I had a really hard time figuring these greens out for some reason. Overall, things worked out well and that price I paid was excellent. I’m glad I got to come out and play the course again, though there’s still something about it that doesn’t quite excite me as much as some of the other great courses throughout the area. It’s a very enjoyable course that I don’t really have anything negative to say about. However, it’s not one I’ll be rushing back to play again. That being said, I wouldn’t turn down an opportunity to play it again if the price and timing is right. 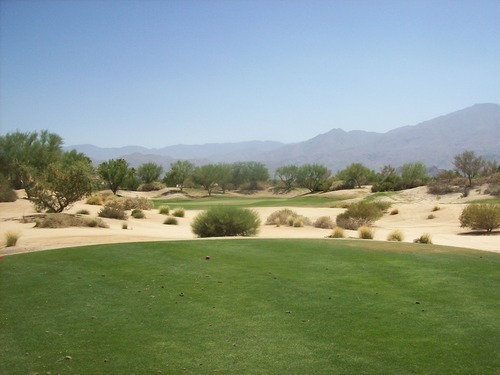 With the more rugged is a nice change of pace within the PGA West/La Quinta Resort course family. 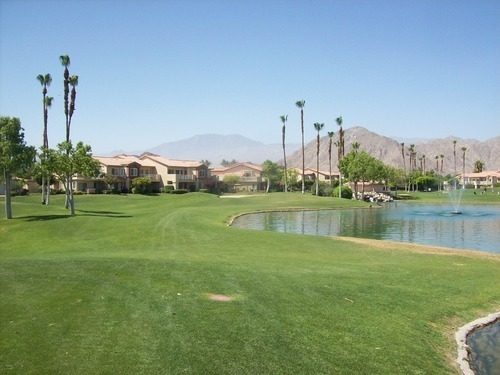 It’s something different than the more traditional Palm Springs clean “oasis” golf course look, so I do like that it stands apart from the crowd in that way. 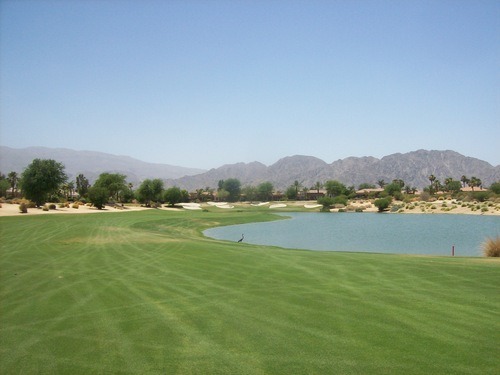 CA, California, Coachella Valley, Desert Horizons Country Club, Golf, Golf Course Architecture, Golf Course Photography, Golf Course Photos, Golf Course Reviews, Golf Courses, Greg Norman, Greg Norman Course, Indian Wells, La Quinta, Palm Royale Country Club, PGA West, Riverside County, Southern California, Ted Robinson Sr.